The 2019 Hyundai Accent is an affordable, attractive subcompact sedan. This little car has plenty of pep and a killer warranty. The Accent has an above-average reliability and a five-year/60,000-mile limited warranty as well as a 10-year/100,000-mile powertrain warranty, one of the best in its class. In this preview guide, we'll give you a walkaround and tell you what's great about the Accent. This time last year, we would have had a lot to say about the all-new 2018 Accent. The 2018 was a complete overhaul and the start of a new generation of Accents. Comparatively, the 2019 Hyundai Accent offers minor updates, mostly to bring this subcompact car visually in line with the rest of the Hyundai lineup. A cascading chrome grille replaces the muted black lines of 2018. These vertical slices of chrome are standard now across the entire range of Hyundai models. Hyundai also added fog lights to the SEL trim and LED headlights to the Limited trim. One of the benefits of the updated chrome grille is now there's more to love about the look of the Hyundai Accent. Accents used to be totally forgettable bubble boxes. Now you can park it confidently next to your boss's car. Get your Accent in one of seven colors, including our favorites: Pomegranate Red and Admiral Blue. We especially like the LED headlights and turn signals on the upper trims. If you get the Limited, you can prop the Accent up higher on 17-inch wheel and hands-free automatic trunk that pops open when you approach with the key. Under the Accent's hood lies a 1.6-liter inline-4 engine. This is a great engine for a commuter car, delivering 130 horsepower and 119 lb-ft. of torque. But the best thing is its fuel economy. With the automatic transmission, this engine gets 28 city miles and 38 highway miles per gallon. The manual gets just 1 mpg less on the highway. 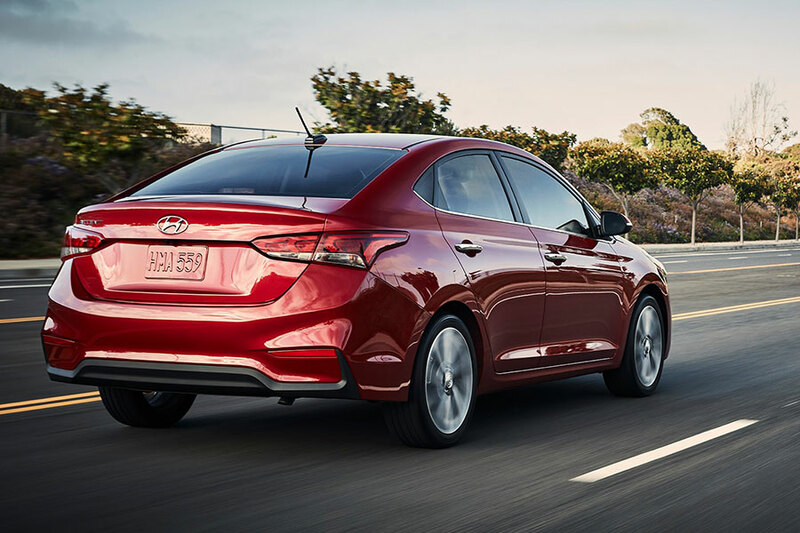 The Accent has a surprising amount of pep while driving though if you're looking for something sportier, you might want to check out the Elantra. 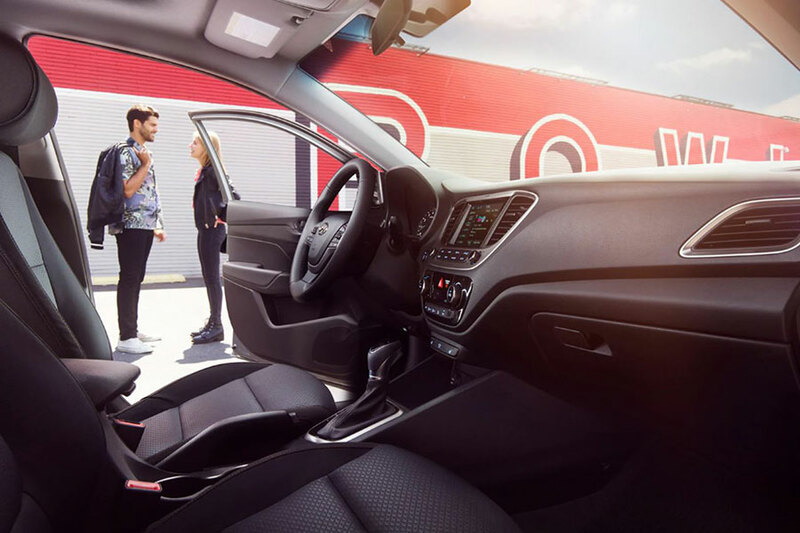 The 2019 Hyundai Accent offers a luxury ride inside. For a car that starts at $15,880, you'd expect something more economical-looking. But the plastics have been ergonomically sculpted into something sleek and stylish looking. All lines draw your eye to the central control panel, which is easy-to-reach and intuitively laid out. We recommend stepping all the way up to the Limited trim, which isn't much more expensive than the base model, to get, for starters, leather-wrapped steering wheel and heated mirrors and seats. You also get a lot of tech at that trim level, including three USB ports, six-speaker audio system with 7-inch touch screen, satellite radio, and Apple CarPlay and Android Auto. If you step to the rear of the car, you'll find a trunk with 14 cubic feet of cargo space. That may not sound like a lot, but it's a ton for the subcompact segment. That'll fit all your luggage for the weekend. Now that you've had the virtual tour, have it in person. Go and check the Accent out at Swope Hyundai today.